Have you visited our pro shop lately? 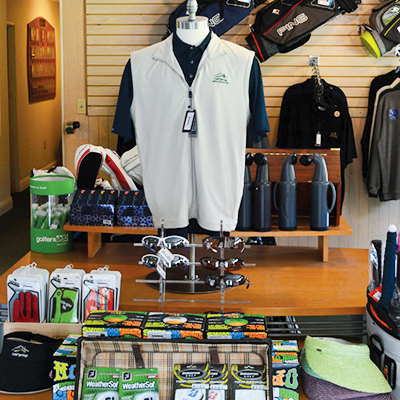 Our cozy golf shop offers you some of the top name brands in the country and a wide range of exciting merchandise options. Whether you're there to make your next tee time, shop for your summer ensemble or ask about golf lessons, our certified PGA staff will give you the best customer service available. Ask for a free ball analysis and see if this is something that could help improve your game. You have the best clubs, but the grip just seems to be wearing down. Don't worry, our staff members can regrip and/or reshaft your clubs at a nominal fee for our members. Every golfer's body and swing are unique to that golfer, based on many factors like height, flexibility, arm length, size of hand, etc. Because of this, if you are a semi-serious golfer or someone just starting the game, it's important you find clubs that fit you and your individual needs. Our staff is certified to fit you to the club or clubs that might not instantly lower your handicap, but will certainly not limit your ability, with some practice time, of attaining that lower handicap.